Winged eyeliner is the perfect way to accent your eyes. It is also the oldest makeup trick that icons used back in the day. Today there are many variations of the infamous cat eye. This makeup look can be elegant, sophisticated, or edgy. It all depends on how you do it. The combination of a precise feline flick and red lips is classic. Nowadays makeup artists are getting so creative and are reinventing it in many different ways. Every woman has probably tried the black winged liner. Sometimes can be hard to do such a precise wing. But after some practice and simple tutorials, you will be able to nail it. If you are already bored with it, you can experiment with different shapes and colors. Zoe Kravitz made a strong case for the graphic eyeliner. The	famous actress doesn’t need a celebrity makeup artist to do her looks. Zoe proved to be great at doing her makeup. For a Saint Laurent show in Paris this March she showed off her	incredible skills at glamming up without any help. Kravitz is the ambassador of the brand, so she used the products of their beauty line. She is known for her contemporary style, both in fashion and in makeup. That is why instead of going with the classic winged eyeliner, the actress decided to do something different. She started out with a simple liner and extended it across her crease. To	escape from the ordinary Zoe added a tiny dot at the angle of the eyeliner. Vanessa Hudgens brought all the drama to this year’s VMAs in August. The singer loves daring makeup looks and bold colors. She is also one of the rare	celebs that can pull them off. For the event, she went with an all-red look, from head to toes. And probably the best thing about her appearance was the	stunning glittery	red eyeliner. It was the first thing that everyone noticed. Vanessa managed to score one of the most talked-about cat eyes in the last few years. Hudgens kept the rest of her makeup simple and let the winged liner do all the talking. With such an eye-catching combination of red and sparkles, she didn’t need more drama. 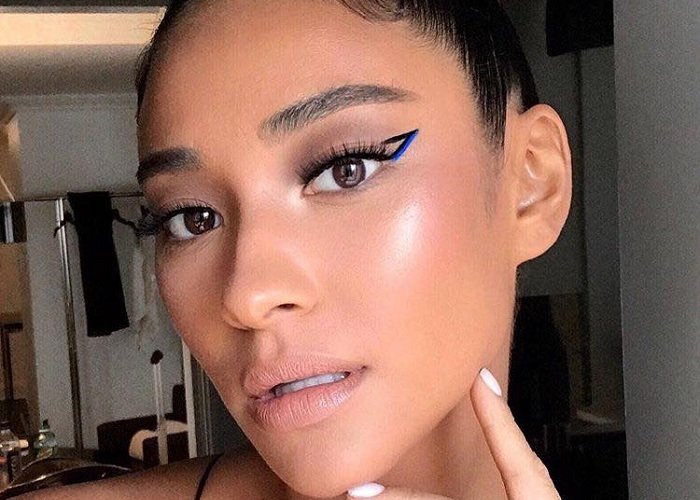 Check out how some of our favorite celebrity unique eyeliner looks. With the holiday season around the corner, you will need motivation for gorgeous and daring makeup looks. A fierce cat eye fits perfectly in that story.